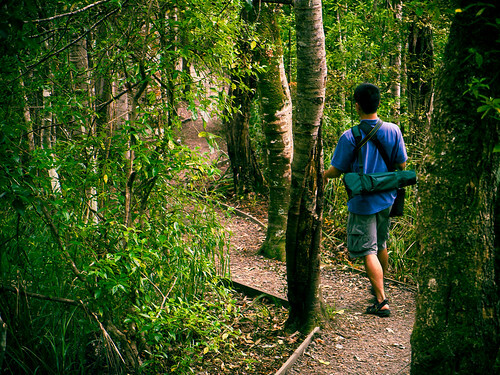 The Okura Estuary Scenic Reserve and the Okura Bush Walkway provide walking access to the north bank of the Okura River and to Karepiro Bay. These are accessed from Stillwater and Haigh Access Road. This is a very pleasant walk that we’ve done a few times now, reasonably easy going, with lots of birdlife (thanks to nearby Tiritirimatangi bird santuary) and some beautiful native trees like pohutukawa and beech. It’s a popular track for joggers as well as hikers. At low tide, you can walk over the mudflats to Karepiro Bay. Depending on how long you linger, the round trip takes approximately 3 hours. During the summer, it’s nice to take your togs and go in for a dip along the way. Dogs are no longer allowed on the track – leave Fido at home. Click here for Department of Conservation info on the track. The walkway winds its way through the Okura River Estuary and coastal forest to Karepiro Bay and historic Dacre Cottage.